discussions are the topic of an electronics course. Thus, there are two important functions which should be built into I/O ports. 2. Data isolation for input ports or data capturing for output ports. 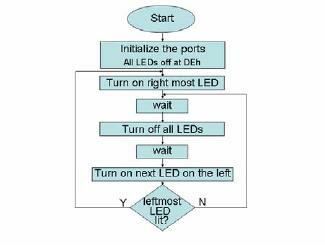 ports or the latch enable input of latches in output ports. inactive for all other situations. proper values. At all other times, the output of the SAD should be deactivated. being fed into the "big AND gate"; other address lines will not be inverted. otherwise it is fed directly into the SAD. 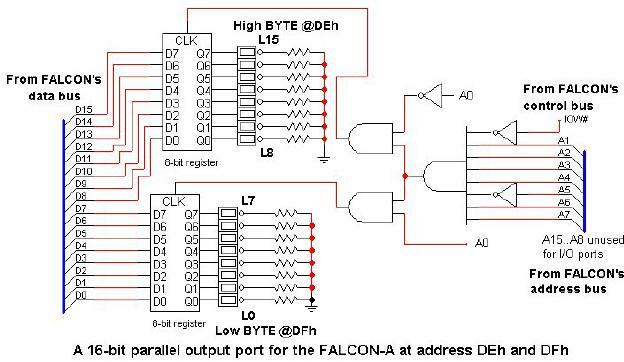 needed, invert the output from the "big AND gate". 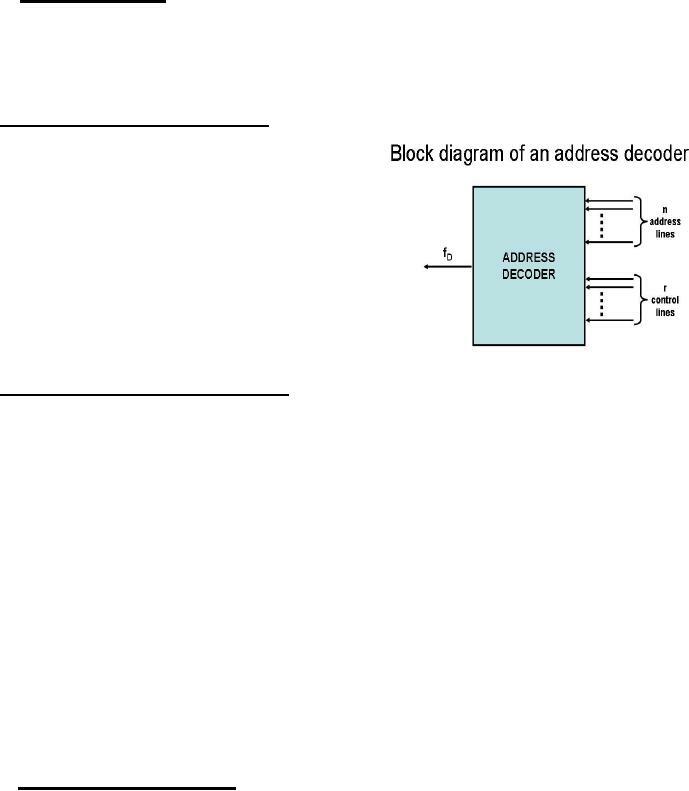 VHDL can be generated and the address decoder can be implemented using PLDs. Alternately, the SAD can be implemented using SSI building blocks. big AND gate in the SAD should be inverted, as described earlier. the SAD should be inverted. address lines will be connected directly to the inputs of the SAD. applied to the input of the SAD. 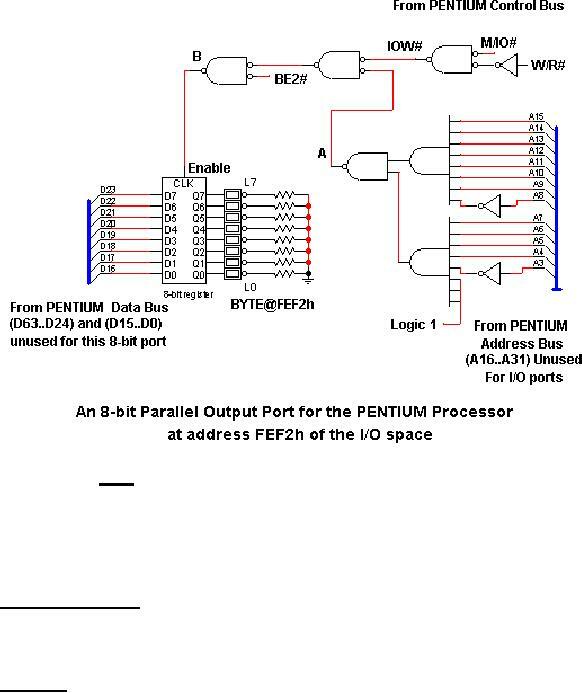 and the Q outputs of the registers will be connected to the peripheral device. registers as shown in the figure below. data bus bit, it turns the LED on; a 0 turns it off. executes on the CPU? Assume r2 contains 1234h. 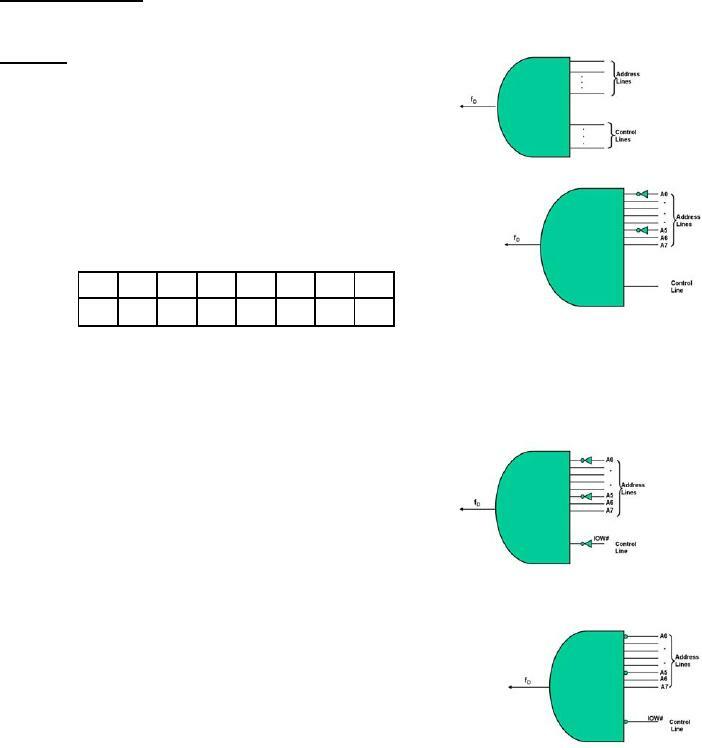 "word boundaries", which means that every port address should be divisible by 2.
bit data bus width, and the "big-endian" data format at the ISA design stage. (LSB) using address DFh. Thus the LEDs at L12, L9, L5, L4 and L2 will turn on. addresses should be divisible by 2. This implies that address line A0 will always be zero. during a transfer, the situation would be different. A0 = 0. 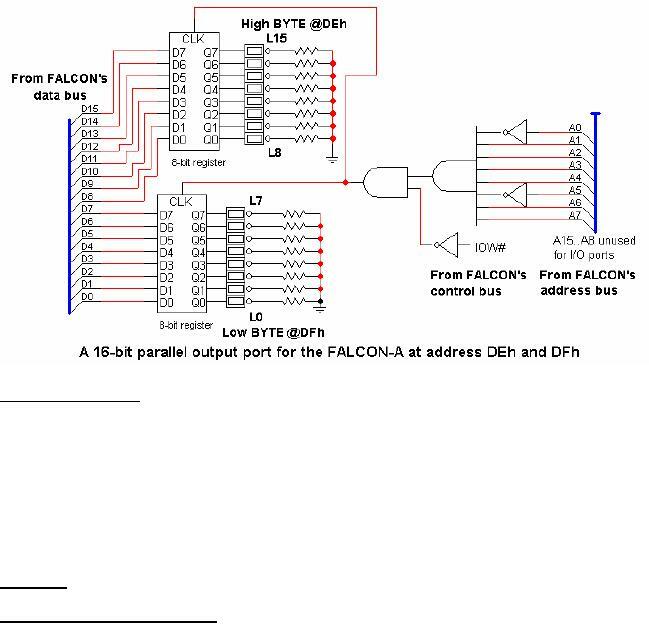 Thus, this output will enable the 8-bit register mapped on the even address DEh. same as it was in the previous figure. the port addresses to even values, then what will be the implications? contains 1234h. This is a 16-bit transfer at address 223 (DFh) and 224 (E0h). addresses DFh and E0h. Thus, that output port cannot be used. then enable that port so that the low byte of data can be placed there. allow the use of part of the CPU registers (or at least for some of them) for I/O transfers. the 8-bit register. The following instructions will access this output port. fragment above. The data byte 12h will be sent to the 8-bit register over lines D23..D16. port of Example #1(lec24). Each LED should stay on for a noticeable duration of time. Repeat from the first LED after the last LED is turned on. on for a noticeable duration of time. presented at the end of this section. software trick. An alternate way would be to use nested loops, but that will tie up additional CPU registers. = frequency of the clock. ET = (3+4) x 65535 / (1x106 ) = 0.